Though there are lots of ways to check weather information, it doesn’t hurt to know that the most popular social network—Facebook allows you to find it in no time. This little feature is available on both its desktop site and mobile apps. Go to the homepage of your Facebook account. 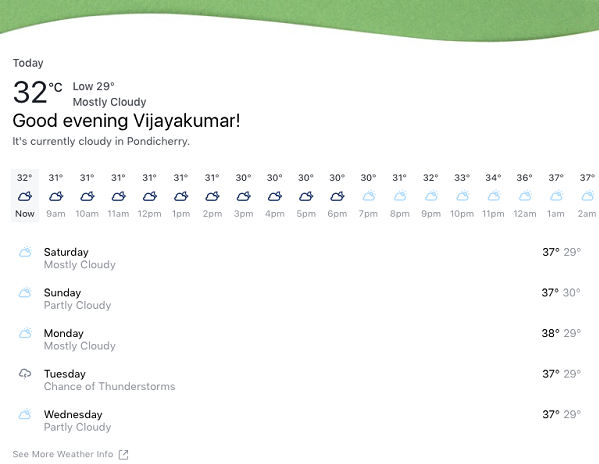 Choose “Weather” by clicking “See More…” under “Explore” in the left navigation pane. Enter the location and the weather info will be displayed. The temperature will be displayed according to the unit selected in Settings. You can change it even here. You can also enable notifications by scrolling down. For Android, tap the hamburger menu icon in the top-right and then scroll to find “Weather” present under “Apps”. For iOS, tap the hamburger More icon in the bottom-right and then “Weather”. Your location is automatically found and weather information is displayed. The layout is similar to the desktop site. You can customize by tapping the gear icon present on the top-right in both the mobile apps. Here you can add a new location, enable notifications and change the temperature unit. You can also check the weather by tapping on the greeting message occasionally displayed at the top of your News Feed once the app is opened. On to the details, an image is displayed on both the desktop site and mobile apps to depict the weather condition. The temperature is displayed for all the hours in a day. Additionally, weather information for next five days is displayed. All the information is fetched from The Weather Channel, which can also be accessed by selecting “See more weather info” at the bottom area.